The Student Corner is our online resource for students to find homework assignments, as well as our current offering of extracurricular activities. Below is the student assignments for each grade. The pages are password-protected; please contact your teacher for the appropriate password. To reserve your spot, please call (817) 204-0300 or email marketing@mosaicacademyfw.org. Art is an interactive elective class that allows students to explore different forms of artistic expression. Students will explore elements of line and symmetry, color, shape and texture. Classes meet by age grouping. Art is included in the Mosaic Academy school day. One-time $30 Supply fee will be included in September invoice. Spanish is an interactive elective class that allows students to explore the language in an immersive, hands-on way. Our Spanish class incorporates movement, music, and conversation. Classes meet by age grouping. Spanish is included in the Mosaic Academy school day. Music is an interactive elective class that allows students to explore music in an immersive, hands-on way. Our music class incorporates movement, singing, and performing on different types of instruments, and provides an introduction to music history, composers, and musical notation. There are several musical performances for parents throughout the school year. Classes meet by age grouping. Music is included in the Mosaic Academy school day. P.E. is an interactive elective class that allows students to explore movement in an immersive, hands-on way. Our P.E. class incorporates physical movement, exercise, group games and activities, and provides an education to leading a healthy lifestyle. Classes meet by age grouping. P.E. is included in the Mosaic Academy school day. ASL is an elective class that allows students to explore the language through immersion and conversation. ASL is included in the Mosaic Academy school day. Students will explore different forms of media during this unit based elective. Each unit will be six-weeks in length throughout the academic school year, and include forms of media such as photography, digital art, marketing, video editing, drama and film, story boarding, writing a blog, communications, creating advertisements, social media 101, and more! Media elective is included during the Mosaic Academy school day. *Wednesday Tutoring commitment is per semester. *Wednesday Tutoring fees will be included in monthly invoices. Wonderfully Made Dance is a donation based ballet ministry of Mosaic Ft Worth that serves as a safe and fun place for children and adults to learn expression and beauty through dance. Every gesture, expression and action speaks about the dancer and reveals a glimpse of their relationship with God. For more information and class times please click here! Ballet is included in the Mosaic Academy school day for those who participate in this elective. 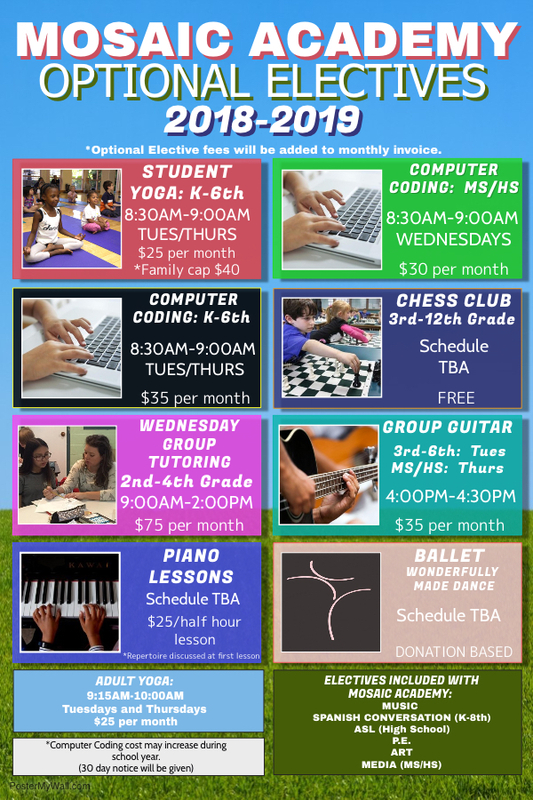 *Some classes may require an additional class outside of the Mosaic Academy schedule. *Recommended donation is $35 per month. A great way for our school age students to get their bodies and minds focused and ready for the work of the day. *Yoga commitment is per semester. *Yoga elective fees will be included in monthly invoice. *Computer Coding elective fees will be added to monthly invoices. *Computer Coding commitment is per academic school year. *Elective fees are subject to change during school year. There will be a 30 day notice prior to fee increase. *Group Guitar elective fees will be added to monthly invoices. *Group Guitar commitment is per semester. *Monthly tuition is due at the first lesson of each month. Cash/Check only. Piano Lesson commitment is per semester. *Limited spacing for individual lessons. Group Lessons Available – email Jennifer at marketing@mosaicacademyfw.org for more information.